Dry brushing the skin is what it sounds like, brushing the dry skin with a natural bristle brush. How Does Dry Brushing Work? As stated, with a natural brush, you brush your dry skin towards your heart prior to a shower or bath. 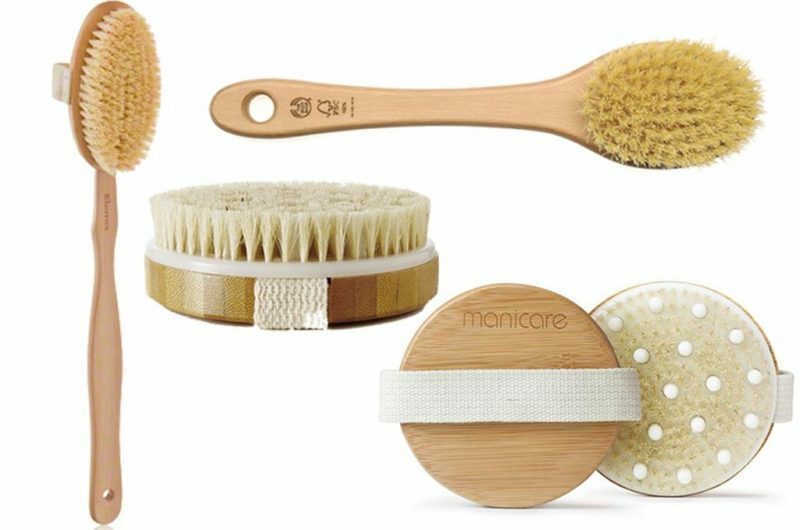 What Is The Benefit of Dry Brushing? Dry brushing the skin has so many benefits. Besides making you feel great and ending up with the softest skin in life, it’s a good way to exfoliate your skin all over. If you workout regularly (or not), your skin can get clogged with dirt and sweat, which can cause body acne or blackheads, and dry brushing is an excellent way to slough off dead skin and to let the skin breath. Dry brushing also aids in supporting the lymphatic system. Because your skin is the largest organ you have, it detoxifies itself though sweating and dry brushing supports the lymphatic flow and helps to detox the skin, too. Another added benefit is that dry brushing can be super energizing! If you ever have the time, dry brushing before your morning shower will fill you with some much feel good energy, you’ll want to find the time to dry brush all of the time! With a firm, natural bristle brush, every stroke you do, should always focus on brushing the skin towards the chest or the center of your body. Starting with on the bottom of the feet, use long soft strokes with applied soft pressure. Work your way up to your legs and arms (start with the palm of your hands) with the same long strokes and applied pressure. On your torso, use circular strokes and and long strokes (with a longer handled brush) on your back. I have done dry brushing off and on over the years. While, it’s not a cure for anything, really, I do it because it feels good and it does make me feel energized. I have noticed that I don’t break out as much on my body in areas like my back and chest as often, especially, when working out regularly and eat clean. I know some people claim that dry brushing is suppose to lessen the look of cellulite, but I have no concrete evidence in my personal experience of that. If my thighs do look a little smoother, it’s usually because I’ve been exercising and that’s where I usually start to see a difference when I do. I will say that after I do dry brush, though, just like facial skin care, any body care product that I use seems to work better. I chalk that up to the fact that my pores are cleaner with the exfoliation benefit of dry brushing. For those reasons alone, I would definitely recommend this technique.